This is multifunctional and professional no power DIY woodworking cutting grinding spindle small lathe accessories, which can fit for table saw, bench drill and electric drill. DIY installation process can also improve your hands-on ability. The gasket is added between the slider and the synchronous wheel, isolating of 1mm to lock tightly. The rotation is smooth and without phase grinding, accuracy is good. 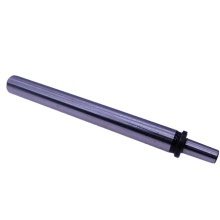 No power spindle is precision machined by grinding machine with an accuracy of 0.005mm. Can DIY bench drills, bench mills, table saws, etc. Through the connecting rod, the shaft sleeve link is eliminated, and the drill clamp is installed directly, so the accuracy is higher. DIY installation process can improve your hands-on ability. 1. Pay attention to the installation direction of the bearing. 2. Do not blindly damage the bearing. 3. The goods are delivered in pieces, which need to be assembled manually. 4. Type 9-12 can use 16mm inner diameter or can meet M10 pole size saw blade. Set does not contain saw blade.